Businesses that recycle help the environment I recently visited a hotel group that was environmentally friendly. I will always support them so let me ask you, are you planning a trip? Whether it is a trip for business or pleasure; you have options and with just a little research you can find a hotel that is environmentally friendly! There are “Green” Hotels in which the hotel does all it can in order to recycle, reuse and reduce. Some of the ways hotels are becoming environmentally friendly are by letting guests know that they will only clean the room upon request; that cuts down on the amount of laundry that needs to be washed, electricity that needs to be used to vacuum and the man power itself, that it needs in order to accommodate for daily cleaning. Hotels can also request that you re-use your towels rather than having them laundered every day. There are programs in some hotels that have bins for recycling glass, plastic and aluminum set up for easy recycling by the guests as well as the employees. Just by making these bins available gives no excuse for why recycling can’t be a success. Hotels that are on the “Green” list are in the forefront of ways to recycle and they are finding that more than 70% of their customers not only abide by their energy and cost saving measures, they have helped to develop them. Many hotels and motels have put suggestion cards in the rooms for their guests to fill out and have implimented some of the ideas that came right from their consumers. If a hotel is a popular spot for banquets and meetings, changes as simple as using pourers for sugar and pitchers for cream have been able to cut down on the waste of individually wrapped sweetners and individual cups of cream. There is also less left over to add to the unused, end-of-the-day waste. Some facilities have gone as far as to place notices on tables in meeting rooms and some restaurants to advise customers that water will be poured, upon request. There are some ways hotels are joining in the cause for an environmentally friendly product that most hotel guests will never see. There are water-saving devices that will save the water that is flushed by about 75%, never affecting the flush in any way, but making quite a difference with the utility costs. Devices such as the toilet tank fill diverter and tiny parts that fit into the head of a shower to cut down on the water useage will not be noticed by the guests but make a big impact on the environment. Hospitality venues that are using these kinds of measures to cut back on our waste and are environmentally contientious should be the places we choose to stay. 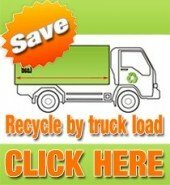 If we, as concerned consumers, take a stand and only patronize hotels and motels and B&Bs that are taking the idea of recycling to heart and have made changes to help the Earth, the more hotels will realize that we know how to exercise our choice and will do so even when we are away from home.